Access leading-edge technologies, scientific experts and Genomics Know-How®. Q2 Solutions | EA Genomics, advances science from understanding the human genome and disease biology to detecting the effects of therapies. We provide whole genome to focused set gene expression profiling and genotyping assays along with DNA and RNA sequencing services, sequence enrichment technologies and bioinformatics analysis expertise to support all product development needs. We offer tailored solutions for challenging specimens such as whole blood and FFPE tissues, as well as nucleic acid isolation and data analysis services. Through carefully orchestrated analyses, we work with you to choose platforms and assays that will distinctly fit your needs, and then use them to deliver valuable, informative data. Our solutions support our clients’ clinical trial and research efforts across the industry spectrum. We work with pharmaceutical, biotechnology, medical device/diagnostic, academic, government and nonprofit clients using a wide array of technology platforms, so that we can determine exactly what works best for you without sacrificing quality or efficiency. Our quality system follows CLSI guidelines and our CLIA-certified and CAP Accredited laboratory supports GLP compliance. 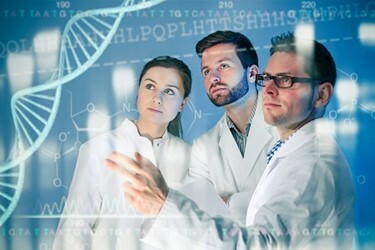 Accelerate drug development with genomic know-how®. Partner with our experts to determine the best methods to obtain the data you need to solve complex biological problems, realize efficiencies, mitigate risks and improve your clinical outcomes.